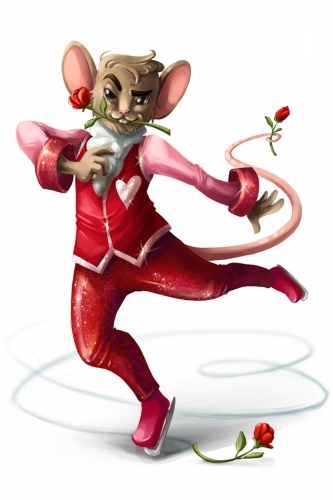 The Lovely Sports Mouse is an Event Mouse found during the annual Valentine's Day or Lunar New Year events. Looking for Love! Zodiac: Icequarius Height: 4 in 1 cm Body Type: Athletic Likes: Cheese, Dance, Ice Skate and YOU! Dislikes: Math, Hamburgers, Water Perfect Date: My idea of the perfect date would be a nice sit-down dinner at a cozy restaurant. Not somewhere super busy, but not completely empty. Maybe a movie before or after, and then a walk on the beach at sunset. Information on how to locate and capture the Lovely Sports Mouse can be found on the current Valentine's Day or Lunar New Year location page. 30 January 2014: The Lovely Sports Mouse was released as part of the Year of the Horse Festival event. This page was last edited on 8 February 2016, at 21:50.